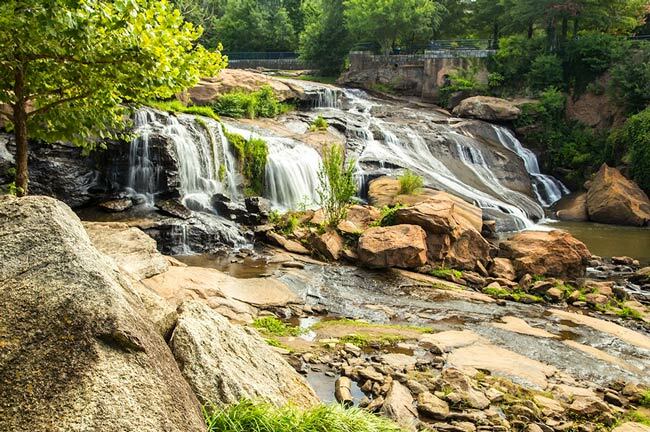 Reedy River Falls is located in Falls Park in downtown Greenville. 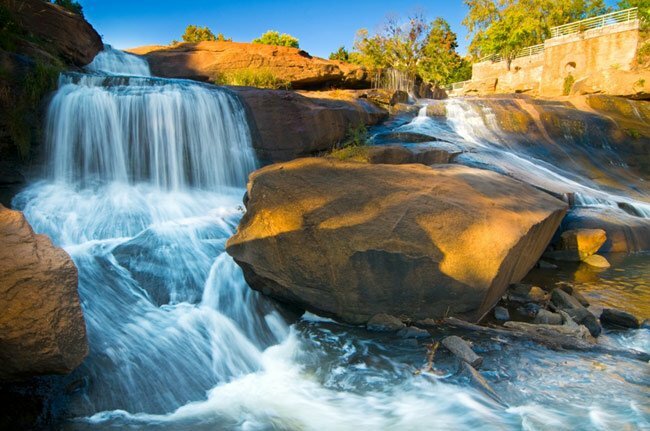 Visitors can enjoy the beautiful landscaped gardens, a scenic walk over the Liberty Bridge, and of course, the picturesque Reedy River. Cherokee Indians lived in what is now Greenville long before any European settlers arrived. 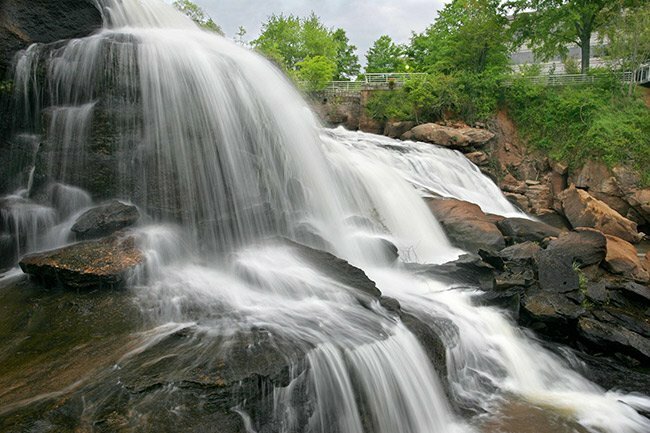 In 1773, Richard Pearis – one of the first white settlers in the area – purchased land along the Reedy River from the Cherokee chiefs so that he could operate his grist mill there. Furman University bought the land in 1852, and three textile mills were built along the river during the early 1900s. Unfortunately, these mills greatly contributed to the pollution and deterioration of the Reedy River. The Carolina Foothills Garden Club bought the land in 1967 and turned it into a 26-acre park. 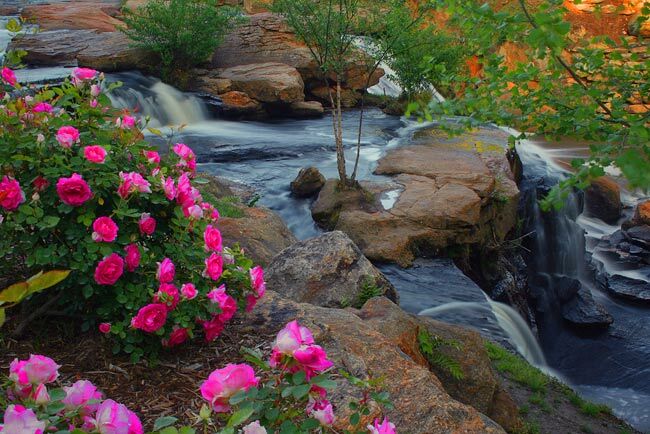 The Garden Club and the City of Greenville worked with corporations as well as state and federal agencies to clean up the river and park, and to restore the historic Falls Cottage. In 1990, public landscaped gardens and the Liberty Bridge were added, which transformed Falls Park into a regional attraction. I would like History on Cox family and Abraham Black Family. Thank you, Karen. This was our first trip! We went to take engagement pictures of my daughter and her fiance. Beautiful place! We will definitely go again! This is pretty – I live down the road! It’s really cool! I have just learned that one of my descendents, Jeremiah Stokes, settled on the Reedy River. It’s pretty neat to go back and look to what he may have seen (well almost).